Steam Whistle Letterpress takes print tradition seriously. That's not to say their cards don't have a sense of humour (they definitely do) but their printing process is no joke. Each card is handset with individual pieces of wood type and run through an antique press up to six times, once for each colour. The result is a beautiful and skillful collection of cards – a "throwback to the days when letterpress was king." So when Steam Whistle moved from Ohio to Kentucky last year, they wanted to make the announcement the old-fashioned way: big news, big broadsheet newspaper. 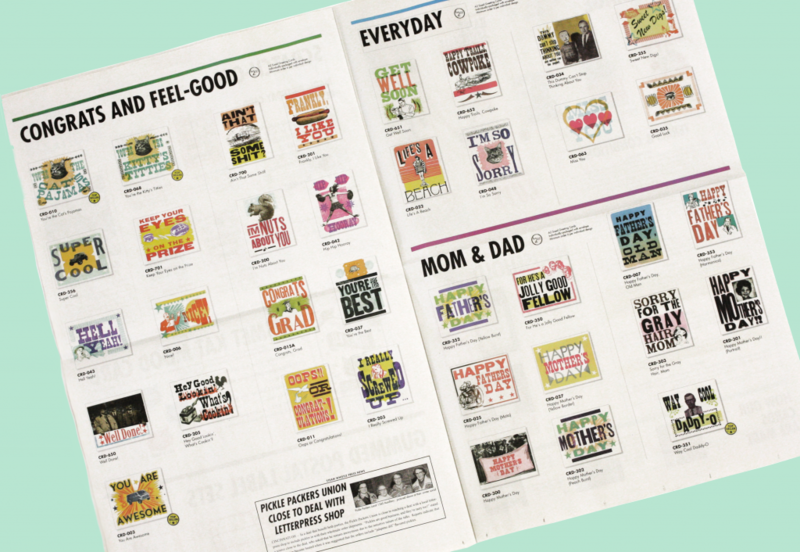 Steam Whistle Press gets the word out and shows off their latest letterpress goods – cards that run the gamut from birthday greetings to holiday wishes from the cat. 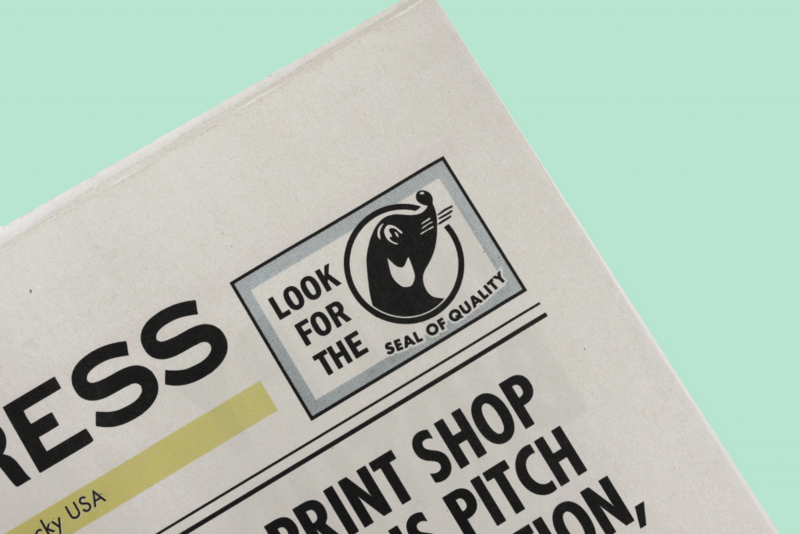 The bold, blocky colours of their letterpress designs look fantastic in newsprint. 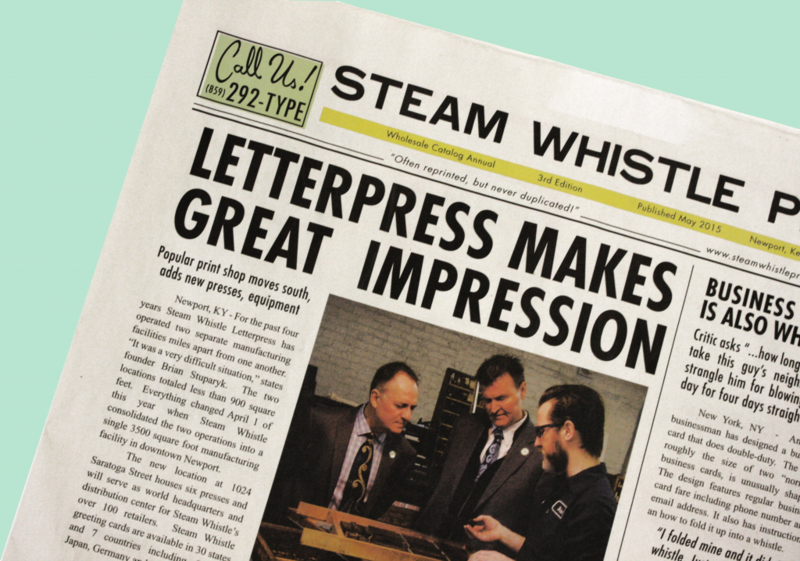 Steam Whistle shared a fun video of both letterpress and newspaper in action. "Our experience working with Newspaper Club was fantastic," says Steam Whistle founder Brian Stuparyk. "We submitted the art on a Thursday and the newspapers arrived at 10 am the following Monday." All retailers and re-sellers who would like a copy of Steam Whistle Press can send a request to wholesale@steamwhistelpress.com. Get your letterpress fix by keeping up with Steam Whistle on Instagram. Learn more about our traditional broadsheet newspapers. Big enough to hide behind, with plenty of room to say everything you need to say. A proper newspaper, printed on a traditional press.